The long-awaited ruling in the preclearance lawsuit by the DC Court has been handed down, and it’s a clean sweep for those who claimed that the new maps violated the law. Nina Perales, litigation director for MALDEF — the Mexican American Legal Defense and Education Fund — said there might not be time to draw new maps before the November elections even if they’re warranted. One question is whether problems exposed in the plans drawn by legislators “infected” the plans drawn by the federal judges in San Antonio. “I don’t think it’s feasible to change the lines for November,” she said. 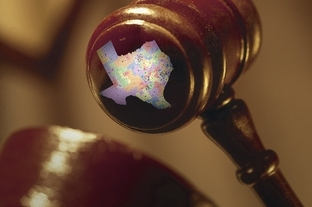 Perales called the federal court ruling “the final nail in the coffin” for the plans drawn by state lawmakers, especially since the San Antonio judges outlined several other legal problems with those same maps earlier this year. 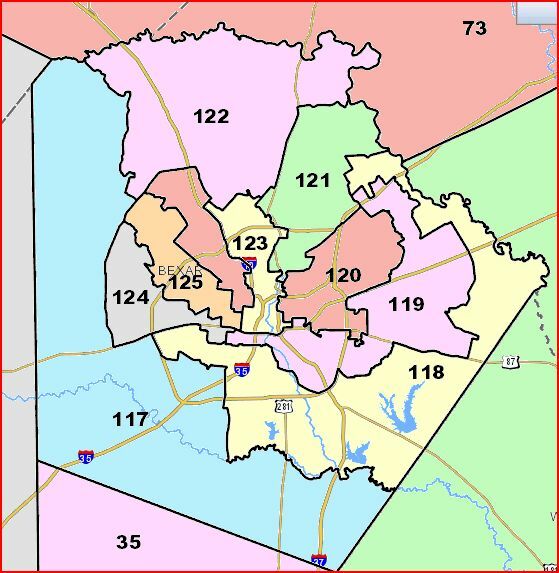 The outcome of Abbott’s appeal and the analyses being done by the various parties in the redistricting legislation will determine which lines, if any, get redrawn before the 2014 elections. 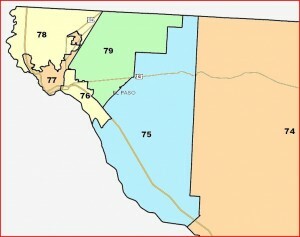 – The opinion was unanimous on all points except for whether the original CD25 (the districts that were in place for elections through 2010 are referred to as “benchmark” districts, while the ones in the state redistricting plans are “enacted”) qualified as a coalition district, i.e., one in which minorities had the ability to elect a candidate of their choice, and on whether the overall Congressional map was retrogressive. The San Antonio court, by contrast, ruled 2-1 in the suit that led to the creation of the interim districts that were later tossed out. – The court found evidence of discriminatory intent in the Congressional and Senate maps. 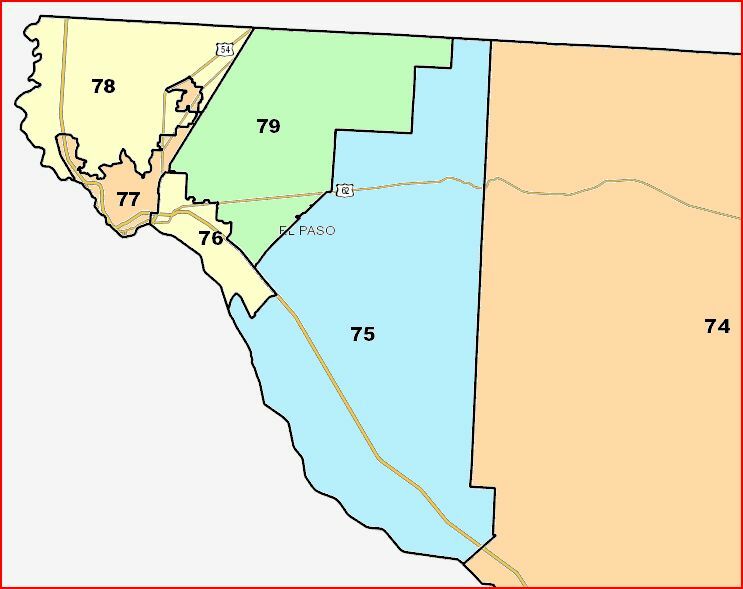 The latter is significant because they did not find that SD10, the only district at issue in that map, met the criteria for being a coalition district. Further, note that the Justice Department did not specifically contest the Senate map – the other intervenors did – meaning that in this case the state got a harsher result than the would have by going to the Justice Department for preclearance instead of filing the lawsuit with the DC Court as they chose to do. First, the process for drawing the House Plan showed little attention to, training on, or concern for the VRA. See, e.g., Trial Tr. 61:1-66:23, Jan. 20, 2012 PM. And despite the dramatic population growth in the State’s Hispanic population that was concentrated primarily in three geographic areas, Texas failed to create any new minority ability districts among 150 relatively small House districts. These concerns are exacerbated by the evidence we received about the process that led to enacted HD 117. As detailed above, the mapdrawers modified HD 117 so that it would elect the Anglo-preferred candidate yet would look like a Hispanic ability district on paper. They accomplished this by switching high-turnout for low-turnout Hispanic voters, hoping to keep the SSVR level just high enough to pass muster under the VRA while changing the district into one that performed for Anglo voters. This testimony is concerning because it shows a deliberate, race-conscious method to manipulate not simply the Democratic vote but, more specifically, the Hispanic vote. Finally, the incredible testimony of the lead House mapdrawer reinforces evidence suggesting mapdrawers cracked VTDs along racial lines to dilute minority voting power. Texas made Interiano’s testimony the cornerstone of its case on purpose in the House Plan. Trial Tr. 45:22-25, Jan. 17, 2012 AM (“[O]ur [discriminatory purpose] case rests largely on the credibility of one person. His name is Gerardo Interiano.”). Interiano spent close to a thousand hours — the equivalent of six months of full-time work — training on the computer program Texas used for redistricting, id. at 131:3-5, yet testified that he did not know about the program’s help function, id. at 85:18-25, Jan. 25, 2012 PM, or of its capability to display racial data at the census block level, id. at 93:13-19, Jan. 17, 2012 PM. As unequivocally demonstrated at trial, this information was readily apparent to even a casual user, let alone one as experienced as Interiano. See id. at 93:1-15; id. at 88:5-89:17, Jan. 25, 2012 PM. The implausibility of Interiano’s professed ignorance of these functions suggests that Texas had something to hide in the way it used racial data to draw district lines. The data about which Interiano claimed ignorance could have allowed him to split voting precincts along racial (but not political) lines in precisely the manner the United States and the Intervenors allege occurred. This and other record evidence may support a finding of discriminatory purpose in enacting the State House Plan. Although we need not reach this issue, at minimum, the full record strongly suggests that the retrogressive effect we have found may not have been accidental. The evidence of discriminatory intent is important not just for the likelihood that the Supreme Court will affirm this decision even if it disagrees on some aspects of the retrogression standard. It also serves as some evidence which could be used to argue, in the Shelby County case or elsewhere, that covered jurisdictions still discriminate on the basis of race in making voting-related decisions. (If this was not done to Anglo Democrats, the evidence is even stronger than if it could be explained on the basis of pure partisanship.) The Court was careful to note that Texas did not challenge the constitutionality of section 5 in this case. And the Court rejected a number of Texas’s arguments that it should read section 5 narrowly to avoid a constitutional question. Whether the Supreme Court will agree with the district court on this point is anyone’s guess. Indeed, this case could be mooted if the Supreme Court strikes down Section 5 (in the Shelby County case or another) before the Court decides this case on the merits. 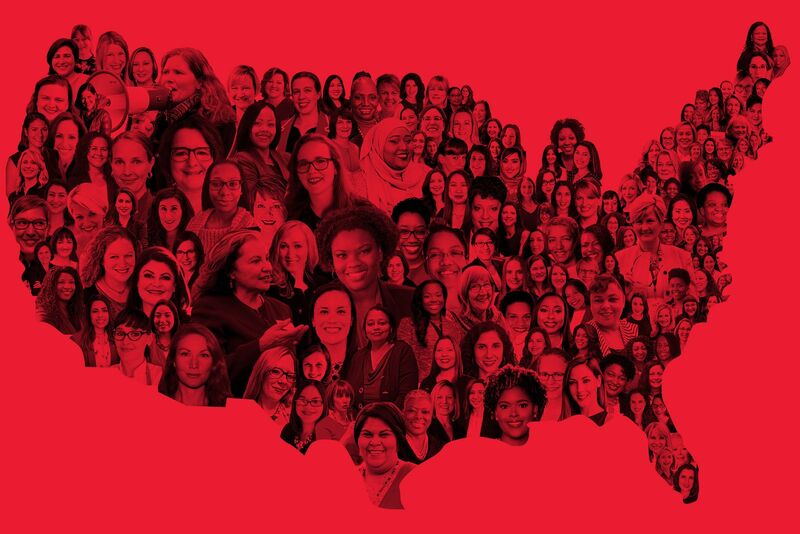 No question that the Republicans treated Sen. Wendy Davis shabbily, but they really stuck it to the three African-American members of Congress. Read the excerpt Hasen highlights to see what I mean. Indeed, read the whole opinion, it’s worth your time. The justices really slap around the state’s main expert, Professor John Alford, and they note repeatedly that the state often simply refused to respond to various arguments made by the intervenors and the Justice Department. It’s quite the bravura performance. So will any of this affect the 2012 election? Michael Li, who has some brief analysis of the opinion, suggests that it could be done. Texas Attorney General Greg Abbott has taken the position that the opinion will not affect the November election, which he says will proceed on the interim maps put into place back in February. On the other hand, it is certainly possible to see a move to adjust those interim maps in the San Antonio court. For example, CD-23 arguably could be restored to its full benchmark configuration fairly easily. Similar arguments might also be made with respect to HD 117 and 149, which are wholly contained in their respective counties (to the extent redistricting plaintiffs think that not enough changes were made to those districts in the interim maps). Other changes would seem harder. But with control of Congress potentially on the line, lots of people are going to be looking at the opinion closely over the next few days. Changes for this year – at least conceptually – are not out of the question. In 1996, for example, the three-judge panel ordered jungle primaries in a number of congressional districts which were held on the date of the November election, with a runoff a month later. Some of the intervenors are leaning in that direction, as you saw in the Trib story. 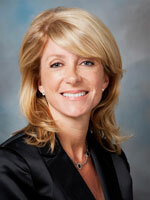 AG Abbott will appeal to the Supreme Court, which may or may not have an effect on that. He’s also seeking to gut the Voting Rights Act in the process, as Hasen alluded to above. On a side note, we may also get a ruling in the Voter ID preclearance case, since it would need to be precleared by August 31 to be able to be implemented this year. So that’s where we stand for now. The Trib story has a bunch of reactions, as does Texas Redistricting. Hair Balls, BOR, Stace, PDiddie, DBN, and Socratic Gadfly have more. UPDATE: Here’s more from SCOTUS Blog, which reminds me that the opinion also repeatedly hammered on Texas’ long history of losing redistricting lawsuits. 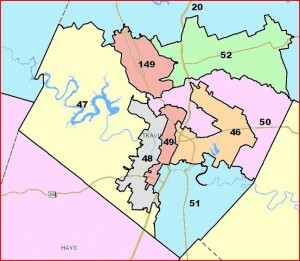 Texas Redistricting has a roundup of other links. Some news out of Bexar County about Democratic legislative candidates. Two former San Antonio councilmen who left office this summer because of term limits are back in politics and gearing up for their first partisan campaigns for seats in the Texas Legislature. Former Councilman Justin Rodriguez, a Democrat, officially announced his candidacy for the District 125 seat on Monday, though he’s been preparing for the race for a while. He’s seeking to replace Rep. Joaquin Castro, D-San Antonio, who is running for the newly created 35th Congressional District. Making his first splash on the Democratic stage, Rodriguez has brought an attention-grabbing name with him. 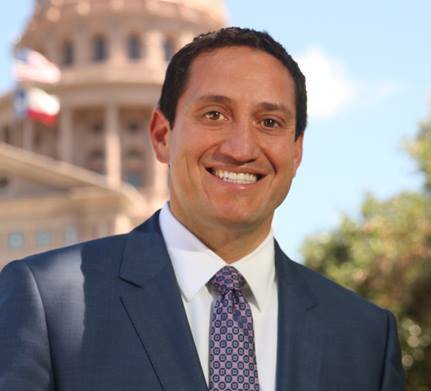 Henry B. Gonzalez III — the grandson of the first Hispanic congressman from Texas — will serve as Rodriguez’s campaign treasurer. “What his grandfather did paved the way for guys like me,” Rodriguez said. The former District 7 councilman will kick off a listening tour after Labor Day and has created a campaign website at www.justin125.com. Councilman Philip Cortez is planning to take on incumbent Rep. John V. Garza, R-San Antonio. But he’ll likely have opponents in the primary race. Tomás Larralde, the executive director of the Hispanic Contractors Association de San Antonio, has already filed paperwork appointing his campaign treasurer. Others are planning to run in the race as well, though Cortez and Larralde are the only two who have filed with the Texas Ethics Commission. Castro’s seat is solid Dem, so the race Rodriguez has to win is the primary, if he gets a challenger. 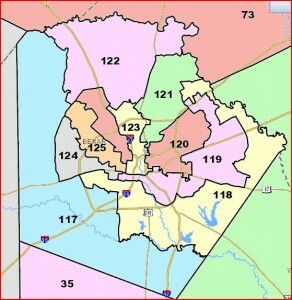 Garza’s seat is HD117, and even after redistricting it was won by every Dem on the ballot in 2008. It’s a must have. I’m still learning about these guys, so I’ll let things play out for awhile before I really think about which one I’d rather see take on Garza. I’m just glad to see the action. On to the urban counties. I’m grouping these three together because there’s really only one opportunity in each, and none of them are truly “new”. But never mind that. Let’s look at some data. 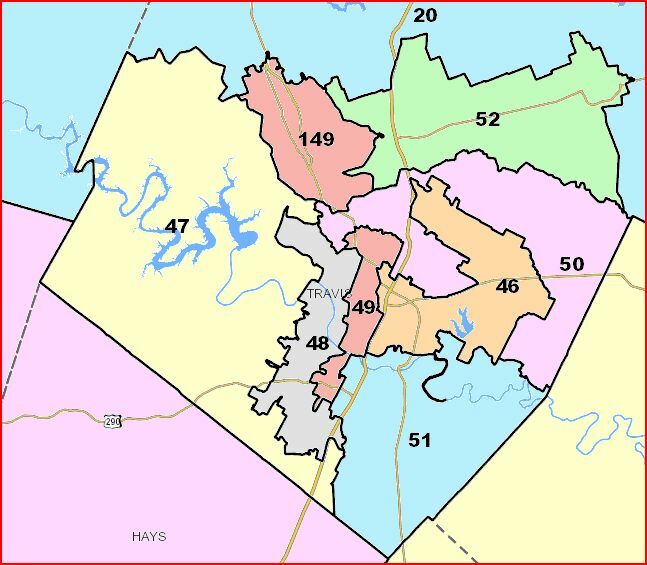 HD47 was the last of the Travis Republican seats from the 2001 redistricting to go blue, and by the skin of Donna Howard’s teeth the only one to fall back in the 2010 wave. Republicans might have tried to draw a 4-2 Dem map for Travis County, but that carried a significant risk of losing them both, as they did with their greedy 3-3 map in 2001. Leaving the map at 5-1 and shoring up their one incumbent was very doable, and with Obama outperforming the rest of the Dem ticket by three or more points, they did a good job of it. Assuming Workman doesn’t do anything stupid, he ought to be in decent shape for awhile. There’s a lot of growth in west and northwest Travis County, however, so there’s no guarantee the demographics or partisan mix of his district will remain the same. And as the lone Republican in the county (not counting the Congressionals, who are only using bits of Travis for their own purposes), he’ll always have a target on his back. He may make it through the decade, but he’s unlikely to have any easy races. Margo was another beneficiary of the 2010 wave, winning an otherwise Democratic-leaning seat in his third try for office; he lost to Eliot Shapleigh for SD29 in 2006, and to Joe Moody for this seat in 2008 to succeed the retiring Republican Pat Haggerty. Unlike Paul Workman in Travis County, there aren’t enough Republican voters in the vicinity to draw him a majority GOP district. Every Democrat carried HD78 in 2008, so barring anything unusual his tenure should be short. For sure, this is a top priority district for the Dems in 2012. Another wave beneficiary who can’t be adequately protected. Democrat David Leibowitz won this seat in 2004, knocking off now-SBOE member Ken Mercer, who had won the seat in 2002 against an indicted opponent. He had not faced any serious challenges and this race was certainly not on my radar last year. As with HD78, every downballot Dem carried this district in 2008, and I feel confident saying that it will be viewed as a must-win seat for the Dems next year.